Your backyard is the outdoor equivalent of your kitchen in the sense that it’s the one place where everyone tends to congregate once the weather starts to warm up in the spring and summer. This is the ideal time of year to start planning your outdoor parties and backyard barbecues, which means it’s also time to start implementing proper garden care to get your outdoor space ready for all the upcoming summer festivities. If you happen to have a small backyard, there are numerous ways in which you can maximize your space and make it equal parts functional and aesthetically pleasing to your guests. Keep reading for a few useful suggestions on how to create your dream backyard with the limited space you have! Despite what you might think, your backyard is actually an outdoor extension of your home and you should treat it accordingly. Incorporate tones and textures in your backyard that match or blend in with those of the exterior of your home to create a cohesive and seamless transition from your indoor to your outdoor space. This will make your small backyard seem a lot bigger than it actually is because visitors will simply view it as a part of your home rather than a separate entity. Much like your yard itself, the landscape design of your entryway should make a statement. It should be uniquely decorated according to your personal preferences, but it should also be as warm and inviting as possible so that people feel right at home rather than out of place when they’re visiting you. Putting in a curved walkway rather than a straight sidewalk also creates the illusion that you have more space than you actually do while also creating architectural intrigue. Vertical gardens have grown in popularity over the past few years partly because they’re fairly easy to maintain and they allow more opportunity for creativity. You can create a number of plant combinations that go well together and establish a certain flow throughout your outdoor space. Vertical gardens and tall trees or plants also take up less space on the ground while adding different levels of texture to the overall design of your landscape. When it comes to small backyards, minimalist landscape design and construction is the best way to go. Having too many plants in a limited amount of space can make your backyard look too cluttered, not to mention it’s not good for the plants. Flowers, trees, shrubs, and other types of greenery all need ample space for their roots to grow and expand under the ground without become entangled with one another. It’s best to choose a few colourful, pretty, and practical plants to adorn your backyard rather than overdoing it. 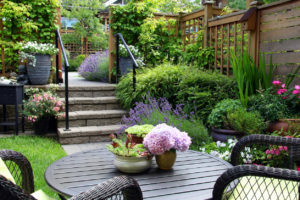 For more landscape design and construction ideas for your outdoor space, contact FOREVER GREEN LAWN & LANDSCAPE INC. We have over 20 years of experience working in the landscaping and gardening industry throughout Toronto and the GTA and our expert landscapers can help you achieve the ideal look for your garden.